JaneVille: Come to Orvieto, Italy with me. Ever wanted to create your own illustrated travel journal? Have you seen people sketching in exotic locales, and thought, gosh, I wish I could do that. You can! Jane knows that everyone has the ability. It just takes the opportunity to slow down, sit in one place and really look, then let your pencil sketch what you see. Orvieto, Italy, an ancient, colorful, hilltop town is full of inspiration. We will spend a week using that inspiration to power your creativity. Each day we'll sketch and watercolor on 5x7" pages of watercolor paper in different areas of this historic, charming city. The last day we'll create a paper-on-cloth portfolio to hold the sketches (as single pages or in an accordion book format) and other found mementos creating your own unique Bella Italia: Orvieto Sketchbook. Jane will gently guide beginners as well as the more experienced to draw what you see, to capture the small details of a place, while savoring sounds, smells, and breezes around you. She and Italy will help you slow down, sit quietly and really ‘be’ in a place, while you sketch and watercolor and journal artfully. Drawing is about seeing, you’ll have the opportunity to record your impressions, as unique as your handwriting, in your Italian sketchbook. The skills you learn here will be with you always, so you can continue to illustrate your travels and your daily life in your journal. Learn to sketch what you see. Spend the morning drawing and painting some of the details of our B&B, its plants and architectural details. Cost - $2475. Fee includes six nights double occupancy lodging and basic course materials. Single occupancy available for an additional cost. Because Italian cuisine is such fun, meals are not prearranged or included - we do give lots of advice! Travel costs are not included. Read the terms and agreements and register here. The trip is just 7 months away. Probably time to decide. We’ll going to have a magical wonderful time, and I hope you can join us. 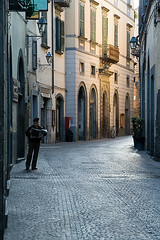 Come with a friend and take my class, or there are other activities to choose from happening the same week, like photography with my friend Jan Phillips or Taste of Orvieto. You can see more of my watercolor sketchbook here.